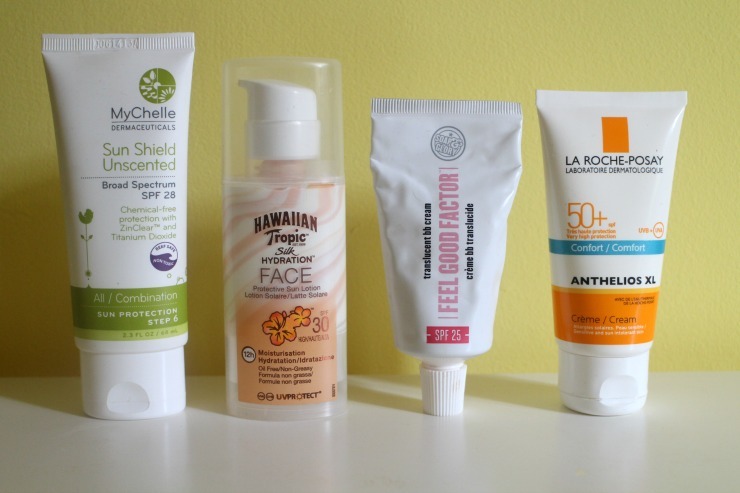 Florence and Mary: What SPF are you using? As I was preparing this post I thought back to school when we were taken aside and told about periods and how to put on a condom and yet we are never taught how to look after our skin, especially against the suns rays. In countries like Australia children must wear hats during play times and applying suncreams is second nature yet in the UK we're often so starved of sun that the merest hint of the sun peeping it's head out of the cards we lose our heads and don't even think of sun protection. 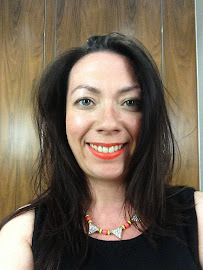 Recently I've been lucky enough to have a few facial skin scans (you can read about one here) and whilst I've dodged the wrinkle bullet the same cannot be said for sun damage. I spent years in my late teens and early twenties on sun beds and holidays were more concerned with the next bar than using sun lotions. Of course I still spent a ridiculous amount of money in Boots prior to my visit but maybe a cursory application in the mornings was all I did and by the end of the week it was reaching for oils and anything to ensure the optimum tan. One thing I am grateful for is my restlessness and boredom in the sun. I just can't lay out there turning every 15 minutes like friends would and instead go off and hide in the shade (and still tan FYI) although as we now know that doesn't mean our skin is protected. Luckily brands like La Roche-Posay and MyChelle are educating bloggers and the public about sun protection and offering staggering statistics that 70% of consumers use the same sun screen on their face as they used on their bodies - could you imagine putting body lotion on your face instead moisturiser? La Roche-Posay Anthelios Cream* and their accompany range are pairing skincare and sun protection so we're not in danger of ruining our diligent skincare regimes. I do find the Anthelios cream the thickest of my line up although it blends in nicely and does not disrupt my make up when in daily use. As the highest factor I reach for this particularly on days when I know I will be out and about in the sun. MyChelle's Unscented Sun Protection* is the lightest consistency of those I own and what I use on slightly cloudy days but with the comfort I know I'll be protected should I choose to spend my lunch break catching a few rays. Hawaiian Tropic Silk Hydration Face Sun Lotion* accompanied me on holiday and I didn't suffer any danger of the dreaded sunburnt nose. I love the scent of this cream but appreciate it won't be too everyone's taste especially when applying before make up and going about your day to day routine. This is usually the product I'll apply when I'm heading to sit in my parents garden but it works just as well when applying make up on top. Finally is something of a hybrid product, Soap & Glory Translucent BB Cream with SPF 25. I tend to use this on no make up days when I'm in the house but could end up popping to a friends and sitting in the garden or stuck in traffic with the roof down on my way back from Tesco. This is the wettest formula but sinks into the skin quickly and does give the appearance on priming well and would be something I'd take along if I were going on a beach holiday where I didn't want to wear make up but wanted something a little more than the au natural bare face. Having this stash has been great to see me getting into the routine of applying facial sun protection as it was something I'd always ignored and will not be forgotten in the future. What about you? Do you apply an additional SPF or rely on your make up products on a daily basis? Umm, whatever happens to be in the face cream/ foundation I may be bunging on! And sometimes I do put body moisturiser on my face! I think there is no hope for me! Slip. Slap. Slop. Isn't that the Aussie phrase? But I do tend to wear a hat in the garden and we have a big turquoise raffia sun brolly that I spend a lot of time under!! To think when I was a kiddie on our 2 week break to the seaside my mum would try in vain to get me to take off my knee length socks 'to get a bit of sun on my legs'! My usual Clarins face cream has an SPF of 15 which isn't enough for me now I've developed rosacea, which is particularly triggered by sunshine. So I'm currently wearing a baby sunblock with SPF 50, but wish I could find a good quality face cream with that amount of protection. I would look into La Roche Posay, they're a great skincare range and they've designed their SPFs for each skin types. Let me know how you get on.